Beets are autumn on a plate. And in this dish, Moroccan spices heighten their already-enticing flavor (not to mention their aroma). Best of all, the recipe is easy to make. So you get sensory overload on a slacker schedule. Our kind of dish! We use traditional red beets in this dish, but golden beets would work just as well. 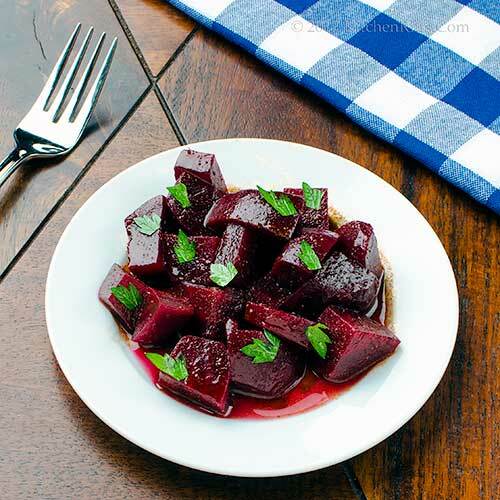 You can roast or boil the beets for this recipe – we give instructions for both. Roasting yields slightly better flavor, but boiling is easier. This recipe was adapted from Paula Wolfert’s Couscous and Other Good Foods from Morocco. The original book has been out of print for a while, but a revised edition is available. Prep time for this dish is about 40 minutes, much of it unattended (30 minutes or so for cooking the beets, plus another 10 minutes for putting the salad together). Then you should let the salad sit for at least an hour (2 or 3 hours is better) so the flavors blend together. This recipe yields 4 starter-size servings. Leftovers keep for a day or two if refrigerated in an airtight container. Cut the leaves off the beets, leaving an inch or so of stalk attached. Do not cut the root ends. Scrub the beets. If roasting: Wrap each beet in aluminum foil. Turn the oven to 400 degrees F, and place the beets in it to roast. Cook until they’re just tender (30 to 45 minutes, depending on the size of the beets). When done, unwrap the beets and allow them to cool. If cooking on the stovetop: Add the beets to a cooking pot filled with cold water. Place on stovetop heat and bring to a simmer. 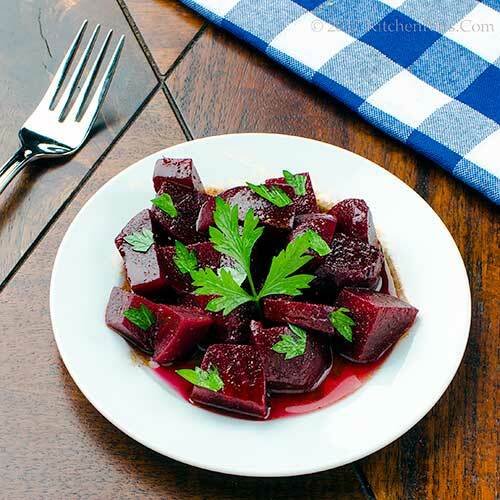 Cook until the beets become tender (20 to 35 minutes, depending on size). When done, drain the beets and allow them to cool (we usually rinse the beets under cold water to speed the cooling process). While the beets are cooling, mix the vinaigrette: Add all remaining ingredients (except parsley/cilantro) to a medium-sized bowl, then whisk them together. Taste, and adjust salt and sugar if necessary. When the beets are cool, cut off their stalks and root ends, then peel them. 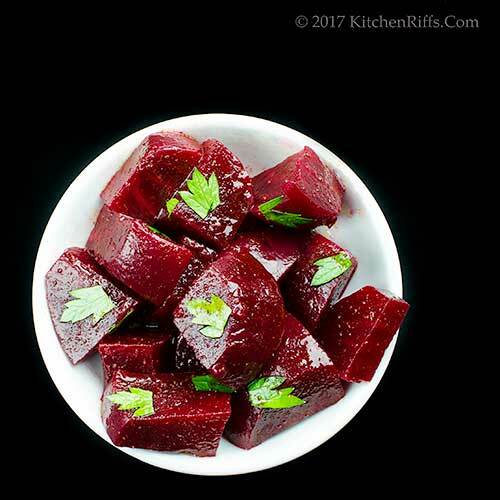 Cut the beets into dice of about ½ inch or slice them thinly. Add them to the mixing bowl, and toss them thoroughly with the vinaigrette. Then let the beets steep in the vinaigrette for at least an hour (or longer; cover with shrink wrap and refrigerate if you marinate them for more than an hour). Right before serving, mince the parsley or cilantro, and toss it with the beets. A little minced garlic would be a welcome addition to this dish. So would chopped scallion and/or freshly ground black pepper. You could also substitute fresh mint for the parsley or cilantro. Don’t have orange blossom water on hand? You could try substituting rose water. We haven’t used it, but suspect it would work well. You could even skip the orange blossom water altogether, but it does add delightful fragrance and flavor. The dish won’t be as good without it. Orange blossom water can be hard to find, but it’s available online (Amazon carries it). BTW, the color of beets doesn’t break down in your digestive system. Expect them to tinge your urine and stool. Just FYI. Beets are usually sold with their greens. When the beets are young, we like to use the greens raw in salads. With the beets are more mature, you can cook the greens as you would spinach. If You Can’t Beet ‘Em . . . .
“Orange you glad I thought of it?” I said. “Just spicing up the conversation,” I said. “Yes, you’re my pun-abler,” I said. “Watch it paprika boy, you could get smoked,” said Mrs K R.
Beet salad is one of the few salads my husband will eat. I can see how orange flower water makes this salad special and I love that you added cumin. What a wonderful recipe John. 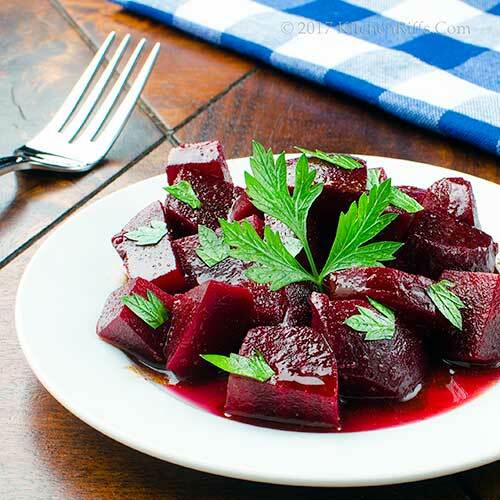 Hi Gerlinde, aren't beet salads wonderful? The orange flower water adds a whole new dimension to beets! Thanks for the comment. I've only recently started to enjoy beets. This salad sounds delicious - great combination of flavors. Hi Pam, not only are the flavors in this wonderful, but the aroma is ambrosia. :-) Thanks for the comment. Hi Pat, the cumin is awesome in this dish! As is the cinnamon. :-) Thanks for the comment. Hi Pam, you could just skip the cumin in this -- a lot of versions of this dish use only cinnamon. The chili powder sounds like a great idea, though! Thanks for the comment. I've never met a beet I didn't like. Thank you John for this very flavorful recipe. I have actually become a huge fan of beets, so I can't wait to check out this salad. Love using herbs in dishes. This is an awesome and healthy salad, John! I can't wait to try this nutrient-dense dish! Hi Karen, can't beat beets, can you? :-) Thanks for the comment. Hi Laura, we're big fans of beets, too. Can't get enough. :-) Thanks for the comment. Hi Agness, this is nutrient-dense. Flavor-dense, too. :-) Thanks for the comment. Hi Amira, your husband will love this! Particularly if he likes orange blossom water. :-) Thanks for the comment. I've been tempted to add the revised edition of Paula Wolfert’s Couscous and Other Good Foods from Morocco to my cookbook library but wasn't sure I'd really use it. If most of the recipes are as scrumptious and as this easy to make as this beet salad I'll dig deeper into the book. Thanks for sharing John! LOVE the flavors you've added to the beets...I may have to plop some goat cheese on top too. So simple, yet so good! Hard to beet the puns this week! Your vacation must have allowed for some creativity! These do sound wonderful and I love the thought of using orange flower water! Orange, I glad you thought about it? Hi Deb, I've looked at the new edition, and there's maybe 20% new stuff added to it. Not enough for me to replace my original edition, but certainly worth it if you don't own that. Thanks for the comment. Hi Judy, I thought of goat cheese, but decided enough was enough. :-) Thanks for the comment. Hi Abbe, bad puns are good. :-) Thanks for the comment. Beautiful! And it sounds delicious! I’ve never loved orange blossom water, but I have some because the bottle is so pretty! I just don’t love perfume-y flavors much. But I trust you!! Hi Mimi, we only use a teaspoon of orange blossom water in this dish so the amount isn't (to us, at least) overwhelming. I'll be curious to see what you think! Thanks for the comment. I haven't had beets for a long time. I feel like I am missing out the big flavor. Looks and sounds great! Hi Holly, we really like beets at this time of the year -- the cool autumn nights seem to sharpen their flavor. Thanks for the comment. Can I just tell you how much I love beets? I love them almost as much as I love puns :). These sound awesome! Hi Kelise, this is a really good dish! The puns? Well, maybe not as good, but loads of fun. :D Thanks for the comment. You must have known that I just made a batch of Moroccan spice mix! This is a simple and wonderful salad. Now all I have to do is to persuade my husband to LOVE this dish. I have grown to love beets as I grew up - same with brussels sprouts. This dish is fabulous with it's spices, John. Will definitely try it. Hi Angie, we'll have another Moroccan dish coming up where you can use your mix. :-) Thanks for the comment. Hi Robyn, the spicing of this dish is really nice -- so aromatic! Thanks for the comment. Hi Tricia, beets definitely are nature's candy! Especially at this time of the year, when the cool nights seem to sweeten them even more. Thanks for the comment. Hi MJ, Bobby will have to make these and tell you how good they are. :D Thanks for the comment. I actually have Orange Blossom water in my pantry! Making these!!! Simple to prepare but it has really exciting flavors. Hi Alyssa, you'll like it! :-) Thanks for the comment. Hi Greg, the beets and spices enjoyed their meet-up. :-) Thanks for the comment. Hi Denise, wonderful flavors! Thanks for the comment. Beets are one of my favorite root veggies and orange is such a perfect compliment, love this salad. I almost added orange slices to this dish but decided that would be over-the-top. Usually I'm not that restrained. :-) Thanks for the comment. I'm a beet fan and anything flavored in Moroccan style is always a treat. Pinning this one. Hi Lea Ann, bet you'll love this! It's a wonderful dish. :-) Thanks for the comment. I still have never had beets before. I feel like I might be the person who thinks they taste like DIRT. I have heard that's a thing, LOL! #closeminded hahahahah! Hi GiGi, they definitely earthy, although in a really good way (think sweet potatoes or even regular potatoes type of earthy). I hated them when I was a kid and my mom served the canned version. But then I tasted them in a restaurant once and wow, I was hooked. And make them all the time now. :-) Thanks for the comment. I am off to the farmer's market tomorrow and will grab some beets for this salad. sounds perfect for this weather. Hi Ansh, this is such a nice dish. Enjoy! Thanks for the comment. What a lovely way to enjoy beets! Hi Amy, it is! :-) Thanks for the comment. I love beets, and love a beet salad ... but I haven't had this one, so thank you! Hi Jeff, you have this one to look forward to. :-) Thanks for the comment. Paprika Boy! I love it!!! The beets, that is. I particularly love roasted beets with goats cheese, so good. The Moroccan spices must add incredible depth to the earthy flavours of the beets, such pretty colours too! Hi Eva, we haven't added goat cheese to this particular dish, but I'll bet it'd be really good. And it's certainly look pretty! :-) Thanks for the comment. This is a delightful recipe and love the addition of orange blossom water. Beets are everywhere at the farmers market so best make use of the season's bounty. Have a super weekend! Hi Bobbi, orange blossom water is such a nice ingredient -- and one we don't use nearly enough. Thanks for the comment. The salad sounds so good with all those beautiful medley of flavors. Hi Taruna, aren't the flavors in this interesting? SO good! Thanks for the comment. I’m a total beetroot girl! Yep in the UK they are beetroots, but whatever we all call them this salad sounds amazing. I would love a plate right now it sounds floral and fragrant which must go with the earthy beetroots so well. Hi Emma, this salad is definitely fragrant. And OK, floral, too. :-) It's good -- you'll like. Thanks for the comment. I love beets! And, I love the thought of orange blossom water with them. I've never had that combination but can't wait to get some beets and try it. Hi Lisa, beets + orange blossom water = mouth delight! Really a good combo. :-) Thanks for the comment. Beets are really growing on me lately! I didn't used to like them! Love this salad! Hi Ashley, beets make such great starters, don't they? Thanks for the comment. The cumin and orange blossom water are great additions. I would definitely make a double-batch just to have leftovers the next day to enjoy. Hi Carolyn, leftovers of this are pretty good. :-) Thanks for the comment. You give the good old beet a new lease on life. Looks delicious. Hi Amalia, beets are wonderful, aren't they? And this recipe is terrific! Thanks for the comment. I do love fresh beets but I also manage to always end up with pink hands. I know...gloves. Still, they are another blast from the past that I despised as a kid served from a can and love as an adult when the beauty of fresh is discovered. Hi Barb, my mom did canned beets when I was a kid, too. And I really hated them! Different story now. :-) Thanks for the comment. Very yummy indeed! An innovative way to serve this little used veg. Hi Liz, beets are so good, aren't they? And they really take well to spices! Thanks for the comment. I really like fresh beets, but I only use a few ways to make them. This spiced beet salad sounds really great, love the spices. I'll keep this one in mind for Thanksgiving. Thanks for sharing, John! Hi Marcelle, we've never served this at Thanksgiving, but it'd be a great dish for that meal! Thanks for the comment.